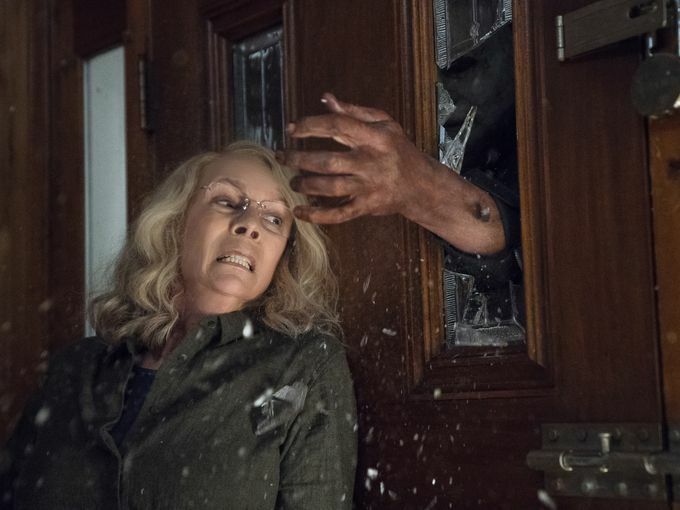 Along with yesterday’s announcement that the first trailer for Blumhouse’s new Halloween movie would be released this Friday (June 8), we were also promised that we’d “get some goodies before then, too,” and the first of those goodies has just arrived in the form of new photos from USA Today featuring Jamie Lee Curtis as Laurie Strode as well as The Shape himself, Michael Myers! In the new film, Laurie has been waiting for Michael’s eventual return for four decades, leading to strained relationships with her daughter, Karen (Judy Greer), and her granddaughter, Allyson (Andi Matichak), as director David Gordon Green says in the accompanying article, “We’re being very honest and truthful about that, how it would affect the upbringing of her daughter, who has a lot of conflicts because of her mother’s obsession with this incident, and her granddaughter, who’s trying to connect” with Laurie, Green says. Of course we will have the trailer for you here at Halloween Daily News as soon as it is released online this Friday morning, June 8, as well as whatever other treats from Haddonfield are released before then, but right now you’ll want to scroll down to check out these three brand new official photos from Halloween 2018. You can see the new photos below! ← Jason Blum Confirms ‘Halloween’ 2018 Teaser Trailer Coming This Friday!